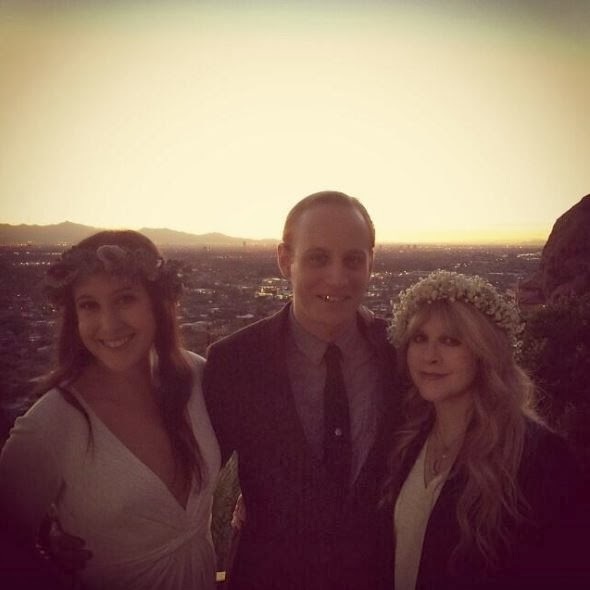 Fleetwood Mac News: 3 Photos: Vanessa Carlton is now a married woman! Stevie Nicks presided over the event! 3 Photos: Vanessa Carlton is now a married woman! Stevie Nicks presided over the event! 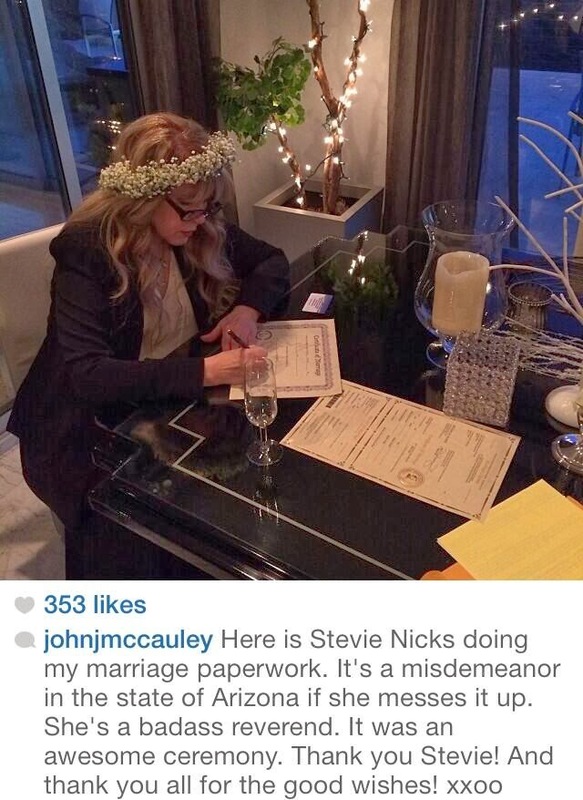 A) Vanessa Carlton just got married to John McCauley! 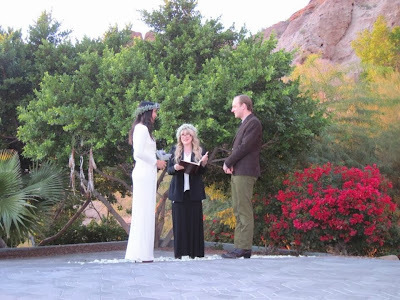 AND B) Stevie Nicks officiated the ceremony! Vanessa Carlton tweeted the above pic Friday evening saying "Thank you Stevie for marrying us!" The wedding took place in Phoenix. How cool is that! Congratulations to Vanessa and her new husband John! Vanessa Carlton takes the cake when it comes to wedding surprises -- by a landslide! The "A Thousand Miles" singer tied the knot with Deer Tick's lead singer and guitarist John McCauley on Friday, Dec. 27, her rep confirms to Us Weekly. 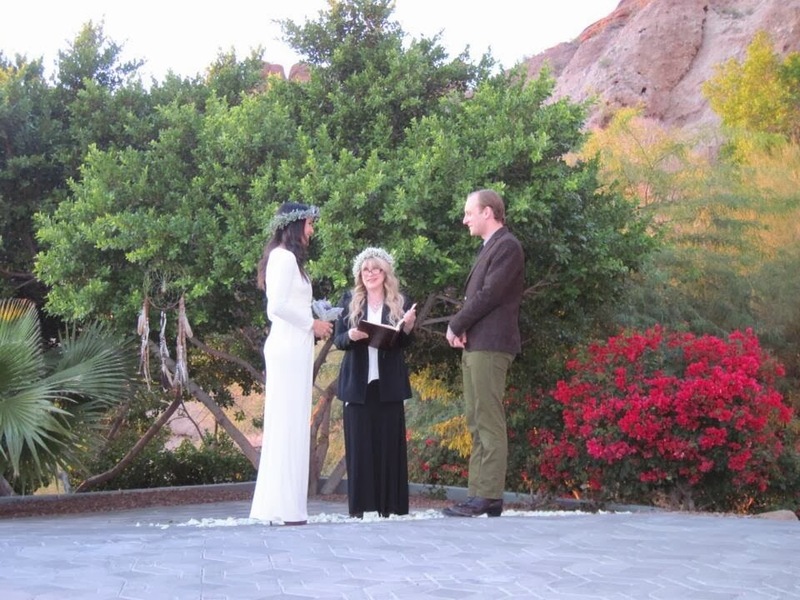 Plus, the new bride shared that Miss Stevie Nicks officiated the ceremony! "Married this gentleman two hours ago xo," the 33-year-old musician wrote via Twitter late Friday night. Alongside the caption, the newlywed shared a photo of herself and her new husband beaming at each other while holding hands. Carlton looked stunning for her special day, wearing a tight-fitting, long-sleeved white wedding gown, and donning a purple head piece and matching flowers. Shortly after, the blushing bride also posted a picture of the couple saying "I do" in front of the Fleetwood Mac songstress. "Thanks Stevie for marrying us!" Carlton gushed. In the photo, Nicks, 65, is seen smiling at Carlton as she officiates the ceremony. She also wears a matching head piece, while McCauley dresses casual in green pants and a brown button-up. HUH? This trips me out. Was this a legal marriage? Stevie's ordained?? Holy smokes! Somebody find me a husband asap. But only if Stevie will marry us. she's not ordained. you can get legally married in many states without a minister. love Deer Tick. I hope John can stay clean and sober for Vanessa. 1. How do you know she's not ordained? It takes VERY little to become ordained. I have a friend who did it online so he could perform his sister's wedding ceremony. Stevie may have had herself ordained simply so she could perform Vanessa's ceremony, or she may not have. I don't know and neither do you. 2. I think that is just the camera angle making her face look goofy, plus the images are blurry. Stevie looks fabulous as always but is definitely aging naturally. If she were getting pulled and tucked then her face would be a lot tighter. Stevie is not an ordained minister and hasn't had any cosmetic surgery. Recently or long ago. i can also tell you that Fleetwood Mac is making a new studio album with Christine McVie. Come on. Stevie HAS had plenty of cosmetic work. start with her teeth and jawline. nose, forehead lift, mid facelift and dermal fillers. I work for a dermatologist and I know this to be true. Who cares if Stevie has had cosmetics done, or not? It is not TONS.......her aging is still natural; neck, etc. I have had two front teeth crowned, as with age they can fracture & chip. She sure resembles "Misty Day" in the one photo as she is just seated at the table with the couple. WOW. This looks like a fun day. I am 63 1/2, no $$$ for a neck or jaw tightening, but it would be nice to have.........Jesum crow - let it go! I hope John is doing the MGM Grand concert!!!!! I thought she looked "pulled" too....alittle too much really she looked better last month!!! Also I know she complained about when she did botox, but seriously Destiny Rules era she looks great way young and that was the botox time right????? Whatever who cares really if I had the money I'd get a boat load of work done!!!!! Ditto. Don't see a problem with a nip or tuck here and there as long as you can afford it, you are healthy enough to go through it and you don't overdo it. You wonder sometimes who advises celebrities. I mean some of them just look awful. I saw Stevie from the front row at the Honda Center and she looked good, body and face, so I don't think she needs much help if at all. She is very pretty by any standard. 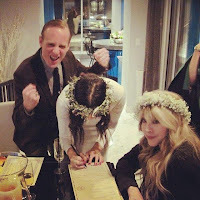 I agree that one picture where Vanessa is signing makes Stevie look odd, as if she got one of those major face altering procedures that only make people look older. But I don't think she did that. She was just caught at a bad angle. Otherwise the other pictures would look the same and they don't. Anybody can be an ordained minister. You can apply online. It takes just a few minutes. That's probably what Stevie did. In the state of Arizona, it was a legal marriage.